someone should just start a new list. Those are words that are making a difference in the way I'm approaching this blog. The rise of Twitter and Facebook keep me connected with my tribe…that's what they are primarily all about. Either this blog will form alliances with others and we will collaborate on something bigger than what this has become OR I will begin writing PRIMARILY with the reader in mind. I'm keeping this in thought today…any comments? Robin: Really good thoughts. I try to write for my readers (I think). They are the ones who take their valuable time to come and read, so one should keep them in mind. I do like to put something personal in from time to time (like my post tomorrow) for a couple of reasons. 1) Lighten the tone. To much heavy stuff can be stifling. 2) Convey a little something about who I am hoping it will add some insight about me (which should help create a little context around the posts), and a little feeling or heart to the blog. I agree about twitter. Great instantaneous tool for connecting with the tribe. Facebook still doesn’t do much for me. Take just to much deliberate work to keep it up. I laughed when I read Seth’s post. It put very well my reaction to that Wired article about blogs. If you’ve got something valuable to say, then say it. There are tribes/niches out there needing leaders. If you don’t lead, then someone else will. And if you are a good leader, then you will lead with the values of the tribe in mind. 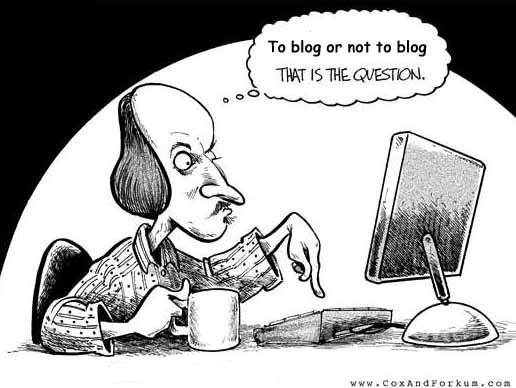 To some extent, I think blogging can be a form of leading a tribe and giving a forum and voice to that tribe.